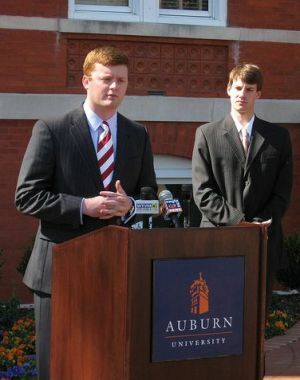 Unity Interrupted: 2010-11 UA SGA President James Fowler and 2010-11 AU SGA Presdident Kurt Sasser announced a joint venture to plant twin trees on their schools’ respective campuses as a show of unity in the wake of the Toomer’s Oaks poisoning. They were never planted. Remember those sister ‘unity trees’ planned for the Auburn and Alabama campuses? We’d forgotten about them, too, until last week. Announced by SGA presidents of both schools in a joint press conference on Samford Lawn on Feb. 23, 2011, the project was the most kumbaya of several public efforts to soothe Tide vs. Tigers tensions following the news that the Toomer’s Oaks had been poisoned. But they aren’t standing, as Bama’s 2010-11 SGA President James described the venture, as “a lasting monument to our rivalry for generations of students.” Because they were never planted. Not that Auburn didn’t try. Despite being met with less the positive reactions by many Auburn fans (“A lot of the emails I received were from people thinking that we were allowing Alabama to replace the Toomer’s Corner trees,” says then Auburn SGA President Kurt Sasser, “when that wasn’t the purpose at all”), Auburn’s participation in the “grassroots student movement” was approved by Auburn’s Vice President of Student Affairs and President Gogue. Auburn’s Tree Preservation Committee was consulted. Tree species were researched. Locations were scouted. By September, plans were in place, at least in Auburn, to plant a tree—more than likely a white oak from the College of Agriculture’s Patterson Greenhouse—on the Student Center Green Space on October 26 of that year, when student leaders from Alabama would be in town for Better Relations Day… except the one who actually needed to be there. UA’s 2011-2012 SGA president, who had naturally assumed the reigns of Bama’s involvement in the project, resigned a month prior in the midst of investigations of “irregularities” within his administration. We’re told the trees simply fell through the crimson cracks. They were never retrieved. You can watch our interview with 2010-2011 Alabama SGA President James Fowler after the initial unity tree press conference here. In all fairness, the trees not getting planted may have a great deal to do with the tornado in Tuscaloosa. I imagine the tree planting may have been planned for spring, and post tornado pretty much everything fell through the cracks here. As an AU alum who lives in Tuscaloosa, I can tell you that the disaster of that tornado trumps the Toomer’s poisoning. Just a thought, might be worth checking into. Thanks, Stephen — yes, definitely trumps the trees. But the SGAs actually only began planning details of the plantings in earnest several months after the tornadoes, in August. Is AU’s SGA Pres wearing his dad’s suit in that picture? Someone get the guy a proper fitting suit. I’m Kurt’s dad, and yes, he is wearing my suit. But we are not complaining, as it was a gift from Tom at T-Town menswear. ^^^ proof that Tom treats all students the same way he treats all those athletes who camp out at his store. So when Julio Jones wore 15 different suits during that one season, that really could have just as easily been some frat guy looking really good for the games each week – all they had to do was ask. Sounds like the UA pres has a real future in politics… already accused of irregularities and not even out of school yet. Yes, let’s make excuses why Bama didn’t follow through. They didn’t follow through, because they are who they are. Full of themselves and hate that can’t be matched.